Here are some January capsule highlights. I'm linking up with In Residence and Just Jacq for this month's Winter Capsule Outfit Showcase. Be sure to check out their and others' January highlights! I love seeing what you wore most or didn't wear! I have loved all the pops of red you've included too! I wish I had a pair of white jeans, I think that would be a great addition! 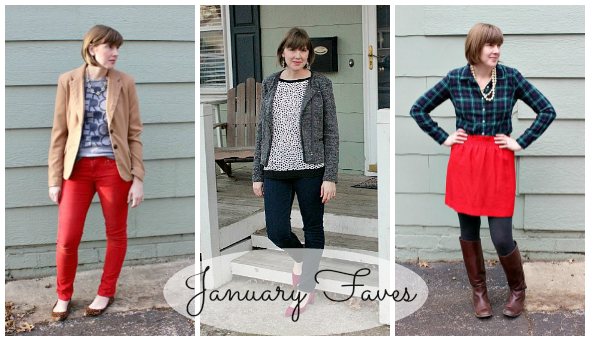 January was stylin' for you, doll! Still loving how you incorporate pops of red. So good! I've been looking for the perfect pair of white jeans as well. That necklace is gorgeous. what a stylish month and those touches of red are fabulous. Thanks Beth--I like seeing those clothing "stats" on other people's blogs so I thought it would be fun to include them as well. I love my white jeans, although I didn't include them because I didn't think they'd be practical in winter because of snowy weather. And yeah, it's snowed one time so far this year. Not that I'm complaining about that, but unpredictable weather is hard to dress for! Love that red skirt look! I need to get more colored bottoms in my wardrobe. Thanks for linking up! It's been crazy warm here for the last week or so, too. I'll take it, though! I love the red jeans and skirt. So pretty! Thanks! Yes, I'm definitely okay with it! I keep checking the weather, thinking, okay, when's it (snow, ice, cold, winter) coming?!? Isn't that interesting that the ones on your "?" list are the least worn so far? That happened to me a bit in fall, and with one cardigan this go-round, and I think that means Goodwill... Love that two of these favorite looks have such a great pop of red - you nailed the winter (not Christmas) red styling. Oh, and you should totally make the swap or just add the white jeans/denim jacket... those are staple items that would make great additions to your winter wardrobe too! Thanks Anne! Yes, it is interesting. I think it means maybe we're getting more and more familiar with what our style and wardrobe needs are (maybe? hopefully?). That red skirt is my fav, it look so pretty on you! Lucky you! I feel like this winter has been all over the place, but mostly cold. Love the plaid and red skirt! I know, I did the same thing with my denim jacket, since I was already including a blazer and utility jacket, which really doesn't layer under big coats... but in the end it's all about working our closets, so if there are unexpectedly pleasant days we should for sure get to embrace them with whatever jacket we want. We can also just say that anything "outerwear" doesn't count :) And I'm going to choose to believe that yes, we really are getting more familiar, which means we might be on our way to graduating from capsule-dom and into just plain smart/pared down wardrobe-dom. Yay! Thanks Krysten! It's one of my faves right now too! I hope some warm weather comes your way soon Lydia!! every time i see those red pants i want a pair. i saw some at old navy that i need! i like your january capsule collection! i love your "pop" of red! great choice of color! Thanks--I've really been loving the red lately! You should get them!! I love having the option of a fun bright pair of pants! The red is a great addition to your items :) I really like that plaid dress - you've proven it's so much more versatile than I would have expected!